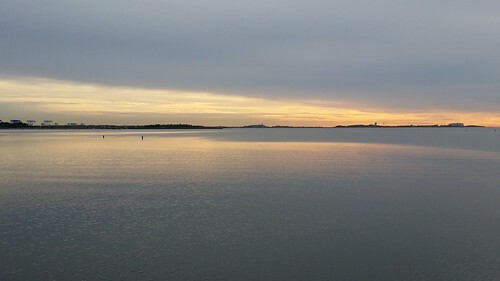 An early morning shot of the water and sunrise behind the clouds. I found this scenery rather serene this morning. I got to UMASS Boston as the early hour of 6am. I spent some time walking around playing Ingress and taking in the calm morning. It' s the last day of a 3-week program and so to find calm waters and a rising sun seemed to capture the mental space of where I am. It's been an intense but powerful few weeks. And though it is the first leg of the journey, I feel rather optimistic about the full journey. I also liked this picture because there's such a swirling mixture of blues and grays that i can be hard to tell where one begins and another ends. This contrasts well with the mixture of yellows of the sun somewhere behind the clouds and yet still able to reflect its colors across the water.